Goldfish thrive best in wild and natural habitat, but when kept in aquariums, bowls or tanks, every bit of care and maintenance should be done for healthy life of your goldfish. Some specific living conditions in optimized amount are marked as best quality living conditions and should be provided periodically in optimum amounts at specified intervals. All this makes your fish happy and healthy and also makes you happy when you watch your goldfish swimming freely. Set up your aquarium with high quality water and living conditions which involve the addition of ammonia and nitrate levels in water to make it safe for your goldfish to live in. Poisoning effects of nitrate and ammonia causes fish to die when introduced into the new water tank. So dechlorinator should be added to prevent killing of your fish from chlorine in tap water. When the nitrate level in water is 20 ppm, you are required to change water up to 50%. Cleaning of your water tank ensures happy and healthy fish who can live for longer periods of time. Hence, you should clean your aquarium once in a week. You do not need to remove fish from the water tank while cleaning but in case of removing, you should always use a plastic container and not any net. Nets injure goldfish fins and fishes are scared of nets which causes stress. Goldfish need more space and cannot live alone for much time otherwise they will be stressed as they are social and love interacting with their fish mates. Goldfish have a life expectancy of up to 20 years, but they often die within a year on premature stage because the owners keep their goldfish in bowls or very small water tanks. In a small tank, goldfish is about the same size as time passes because in such a small place its exterior stops growing. There are many reasons to avoid keeping goldfish in a bowl or a very small tank. Waste production due to the veggies they consume, can cause ammonia poisoning. Oxygen is required in large amounts by fish and restriction on surface area causes fish to gasp for air. Change in water quality and temperature cause a great effect in small tanks and proves to be fatal. If goldfish are kept in bowls or small tanks, their life expectancy is drastically reduced. It results in diseases choking them to death. Show some respect, even if the animal is not cute and cuddly. Goldfish needs clean space, perfect living condition and if you are not able to provide them with that, do not buy them. It is always advised to not to wash your fish with soap as it is poisonous and kills fishes quickly. 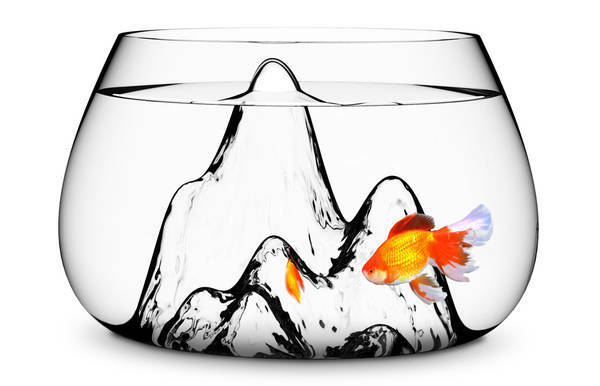 Neither use tap water for water tank because it lacks some important minerals necessary for goldfish. Buying a water conditioner and putting it in the specified amount in water tank solves this problem. Goldfish do not have any eyelids and thinking that goldfish did not sleep may be wrong. Change of color and inactivity when seen sticking to side of water tank tells that goldfish needs to sleep in the dark. The Oxygen level should also be maintained periodically and a stage should never come when your fish needs to gasp for air. As the temperature of the water tank is reduced, oxygen levels rise. To avoid up to 95% goldfish water tank problems, it is very important to maintain a good amount of ammonia, nitrite, oxygen levels and pH levels. Optimum pH levels and water temperature are very important for healthy fish. You should measure ammonia, pH and nitrate in a water tank in which pH should be 6.5 to 8.25 while ammonia and nitrite levels should be 0. With the change of seasons, temperature of water should also be changed accordingly. The Temperature should not be above 75°F. Goldfish will never eat anything below 50-55°F. Breeding season requires a steady temperature of 74°F. Even if we are maintaining and taking care of fish on a daily basis, it happens sometimes that even we care a lot and give our best efforts, some things still fall bad like a tank water change its color to white, green or it may become yellow in color. This change of color of tank water to yellow, white or green is known as cloudy aquarium water and needs to be fixed as it is not a big deal to fix. Every water color of spectrum explains a specific type of problem. It may be bacteria, algae or decayed plants. It’s not something to get panic. So, do not panic and change your water with another cycle.